Your eyes are often the first thing that people notice about your appearance and are probably the most important aspect of facial attractiveness. Loose skin around your eyes can make you look tired or sad or older than you really are. Fortunately, with modern treatments and advances in an eyelid rejuvenation procedure called blepharoplasty, your doctor can help restore a more youthful, alert, and healthy look to your eyes. Blepharoplasty has become one of the most popular cosmetic procedures for both men and women because of its high level of patient satisfaction. Whether the surgery is desired for functional or cosmetic reasons, your choice of a qualified surgeon is of utmost importance. The doctors of Campbell, Cunningham & Taylor are part of a 55-year tradition of caring for eyes in East Tennessee. Each doctor specializes in eyelid plastic surgery. Schedule an appointment today by calling (865) 584-0905. Your eyes are an important part of your appearance. But as time progresses, many people develop extra tissue above and below the eyes. Even people who take great care of themselves can develop extra eye tissue. Fatty deposits may cause the eyelids to sag while tissue beneath the eyes puffs out. 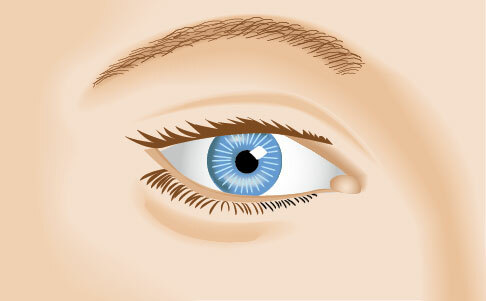 The condition in which eyelids are affected is referred to as dermatochalasis. This condition can have an impact on how you look and could diminish how well you see. Dermatochalasis occurs when the elastic fibers underneath the surface of the skin become stretched. Thinning and protrusion of the skin usually accompany this stretching. It is typically the soft, loose tissues of the upper lids that are most affected by dermatochalasis. In some cases, skin actually lies on top of the lashes which means patients can keep their eyes open only by keeping the brow elevated with the muscles of the forehead and scalp. Headaches and fatigue—especially with reading—may result. Of equal concern is the fact that the upper portion of the visual field may also be cut off by this excessive tissue. Dermatochalasis also affects lower eyelids, but usually to a lesser degree. Blepharoplasty includes removal of excess tissue around the eyelids. 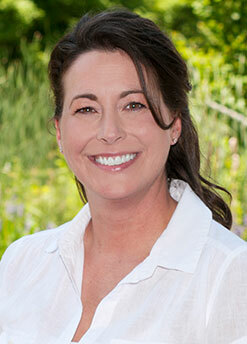 At Campbell, Cunningham & Taylor, P.C., we will evaluate your condition and make treatment recommendations. These could range from antibiotics and steroid eye drops to treat your dermatochalasis to surgery in order to permanently correct it. The surgical solution, known as “blepharoplasty,” is performed at the Eye Surgery Center of East Tennessee. With blepharoplasty, you may receive a local anesthetic plus a mild sedative to help you relax. Your surgery is performed on an outpatient basis. The type of blepharoplasty procedure you undergo will depend on whether tissue is being removed from your upper or lower eyelids. Upper eyelid. The doctor will remove excess skin, muscle and fatty tissue that tends to accumulate close to the nose at the inside corner of the eye. Incisions are made along natural folds in your skin. This means that, as the skin heals, incision areas become virtually impossible to notice. Lower eyelid. In some cases, the incision can be made behind the eyelid, allowing for removal of fatty tissue without an external incision. 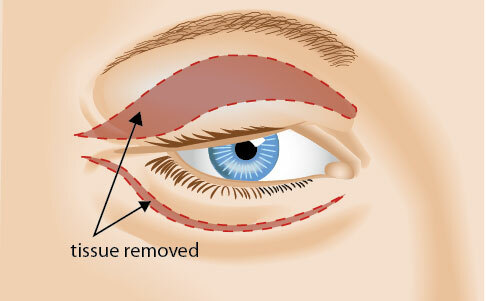 If an external incision is required to remove excessive skin or muscle folds below the eye, it is typically made just below the base of the bottom eyelashes. The symptom of greatest concern is the diminished field of vision that may occur from excess eyelid tissue. You will need someone to drive you home from your procedure and should avoid driving for at least 24 hours after your procedure. In addition, some bruising and swelling is natural and noticeable. We recommend both cold compresses and head elevation to help counter these conditions and speed your recovery. In some cases, your doctor will prescribe eye drops, ointments or medication to ease discomfort after the procedure, although most patients require little or no pain medication. Please note that recovery times vary by patient. Patients will notice improvement in vision and cosmetic appearance in as little as two weeks. However, complete cosmetic recovery can take several months to a year. As with any surgery, complications can occur. Serious complications, however, are rare with blepharoplasty and most that do occur can usually be corrected. Be sure to ask your doctor any questions you may have regarding risks and complications before giving your consent for blepharoplasty. Whether or not insurance covers blepharoplasty will depend on your specific insurance plan. Typically, insurance will not cover the procedure when done purely for cosmetic reasons. However, some patients have a field of vision and eyesight that is compromised and therefore, a blepharoplasty procedure may be medically necessary . Schedule an appointment with Campbell, Cunningham & Taylor to find out more. An examination and consultation with our doctors will help determine if blepharoplasty is recommended. We will check with the individual’s insurance provider to find out if the procedure is covered.